From the Academy Award-winning team, directors Jennifer Lee and Chris Buck, and producer Peter Del Vecho, and featuring the voices of Idina Menzel, Kristen Bell, Jonathan Groff and Josh Gad, and the music of Oscar-winning songwriters Kristen Anderson-Lopez and Robert Lopez, Walt Disney Animation Studios' Frozen 2 opens in U.S. theaters on Nov. 22, 2019. Today, Disney delivers the first trailer and poster for Frozen 2. It has been almost 6 years since Elsa and Anna graced the big screen, turning the original song 'Let It Go' into a phenomenon that still rages to this day, getting parodied in many TV shows and movies. Frozen is one of the biggest original Disney animated movies ever made. And now, the adventure continues. Olaf's Frozen Adventure hit theaters back in 2017. It was intended to be a short, opening in front of Disney•Pixar's Coco, but filled with four new songs and running at almost a half an hour, it actually caused a backlash that saw many parents complaining about its length. It was eventually pulled from theaters, and instead aired as a Holiday special on ABC. It was almost akin to the Star Wars Holiday Special. But 6 years is a long time to wait. Now, Disney is returning with a proper feature length adventure for this year's Holiday season, which should dominate Thanksgiving until Star Wars 9 arrives around Christmas time. The 2013 smash hit was a monster at the box office, and it's expected that Frozen 2 could be even bigger. In this first look footage, we watch as Elsa (once again played by Idina Menzel) uses her special powers to galavant across a body of water. We even get to watch her freeze a wave, which she proceeds to climb. Also returning is her royal sister Anna, featuring the returning voice talents of Kristen Bell. Other memorable characters are also back for more fun, including Jonathan Groff as Kristoff and Josh Gad as Olaf, as they all peer out over a cliff, overlooking an autumn landscape. While most of the returning cast is back, we'll also be hearing from new co-stars Sterling K. Brown, who also has the horror thriller Us coming out next month, and Evan Rachel Wood, who just announced this past week that she's gearing up to shoot season 3 of HBO's hit series Westworld. Returning to direct Frozen 2 are Chris Buck and Jennifer Lee, with Lee recently taking over as Chief Creative Officer at Walt Disney Animation Studios. 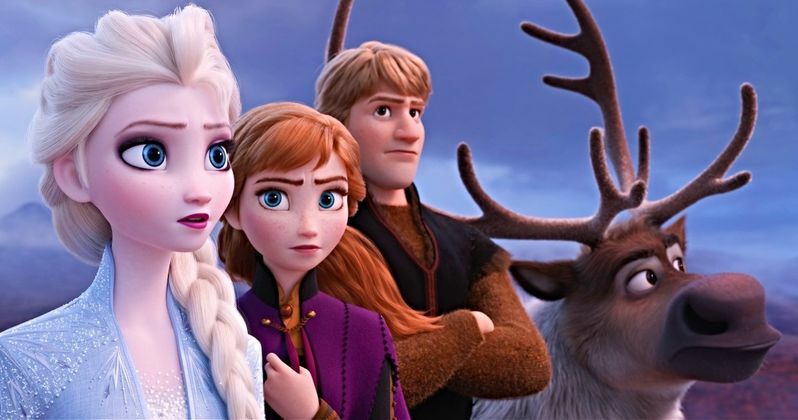 Fans will once again be transported to Arendelle, with all new songs coming from original contributors Robert Lopez and Kristen Anderson-Lopez. Will they have another 'Let It Go' on their hands? One can only hope. Lee and Allison Schroeder, perhaps best known for her work on Hidden Figures, are writing the script. Peter Del Vecho is returning as producer. Some didn't believe Frozen would get a sequel, as Disney viewed the movie as a sacred thing. It was finally announced in March 2015, and now three years later, we finally get to see a glimpse of what it will look like, with the first footage arriving from Walt Disney Pictures. The original soared past $1.2 billion at the box office. And is still the highest grossing animated movie of all time. An avalanche of merchandise has followed, and there's even a Broadway musical.